Custom Spiral staircase joins the living room to the loft and bedrooms upstairs. Enjoy the view through cathedral windows in the livingroom Warm and wonderful cabin. Emmett`s Escape - Relaxing home on level lot ... a perfect escape! Following available parking for 4-5 vehicles in the circular drive, there are approximately 15- 20 wide steps down to the front door. 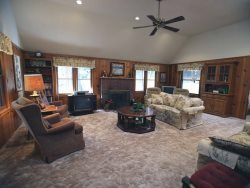 Enter into front hall or "mud room" and continue to the first floor which boasts a full bath (tub and shower) and spacious living/dining/ kitchen great room. The most spectacular part of this home is the downstairs living area. Stunning Cathedral windows in the large living room open to the dining area and kitchen. A gorgeous custom spiral staircase joins the living room to the spaces on the second level. Upstairs are three bedrooms and a loft area, which consists of two single beds. The 1st and 2nd bedrooms each have queen beds and the 3rd bedroom has two singles. EACH bedroom has an attached, full bathroom. The kitchen is fully equipped, and there is a large deck with new deck furniture and a BBQ. Dog lovers rejoice! Dog allowed with an "damage protection fee" but you MUST request written approval from our management team. This home is tastefully decorated and the perfect getaway home for all seasons. Linen service is not included with this rental - call 209-586-5204 if you would like us to provide linen.